RANCHO MIRAGE, Calif. -- Palm Springs and the entirety of the Coachella Valley golf spectrum are replete with all strata of tracks amid its desert bosom of nearly 125 golf courses. Rancho Mirage Country Club's second hole begins a fine five-hole run. This course sits at the intersection of two of the most famous roads in Palm Springs: Bob Hope Drive and Frank Sinatra Drive. Yet, it's one of the better kept secrets in the golf scene. Rancho Mirage Country Club in Ranch Mirage is a semi-private club available to outside play through stay & play packages so it does not do a lot of publicity. There are your historic courses, your ultra-privates, your "Golf Boom" era, your high-end publics (along with a few modest offerings) and a few newbies that caught the tail-end of the New Millennium "Big Course" age. And then, not to be forgotten, there are your '80s decade, housing-complex courses. 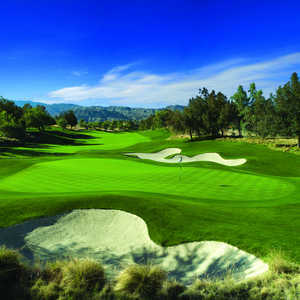 Typically routed through residential lining and oftentimes overlooked by the valley visitor, these babies can prove touch-and-go playing prospects on the whole, but nonetheless offer guests what locals already know: There is some serious value here, and a few of these courses provide some surprisingly stout challenges. Among this lot is Rancho Mirage Country Club. Playing at just 6,100 yards from the tips (par 70 for men, par 72 for ladies), the 1985 design by Harold Heers is a well kept, semi-private (open to the public) desert where speedy, undulating greens, a host of engaging water features, some burly par 4s and pleasing mountain vistas combine to provide some real backbone. "But it's a really good 6,100 yards," says Vicki Woodcock, head professional at Rancho Mirage Country Club. "So even the younger people who come out and play, they come off the course and say, 'Wow, this wasn't as easy as I thought.'" Popular among the senior set, the grounds will indeed test mid-handicappers as well. Sporting water on nine holes (though four of those are namely for ornamental purposes) and carding five par 4s of at least 400 yards, Rancho Mirage has a way of eschewing its seeming timidity. "There's a lot of water out there, and it's tree lined," Woodcock said. "I wouldn't necessarily say it's an 'old traditional' course because there's some elevation in it, and the greens are elevated, so it's a good mix." Coupled with the elevation, the greens offer some sneaky speed and contour. "I love the greens; they can be tricky, but I love the way your ball hits the greens and sits-up and also the way they roll when you putt," said Freddie Carroll, a single-digit player and resident of neighboring Palm Desert. "For the most part, all of the greens have some shape, which is a nice feature," Woodcock continued of the course's 10 multi-tiered putting surfaces. "I would say, in some regard, that the greens almost resemble a (Jack) Nicklaus-designed green with the undulations; they really make you think, which I like." And players will like a host of fun holes, starting with a fine run on no. 2-no. 6. Of the pretty, 401-yard, par-4 second, Woodcock said: "When you're coming into the green, the water is on the right-hand side, and in my opinion, you have to hit a pretty bad shot to go into the water, because it's got bougainvillea all along the edges, so you're aiming toward the left." Rancho Mirage's meaty, 418-yard third sports water to the front left of the green before the diminutive, 336-yard, par-4 fifth hole provides the shot-making, downhill task of navigating around water guarding the deep fairway and surrounding the bunker-laden putting surface. An engaging run on holes 11-14 highlight the back side. "The par-3 11th is short, but with a postage-stamp green, a bunker in the front and another bunker in the back right," Woodcock said. "You have to hit a good shot in there, and I feel sorry for people who hit a longer iron or wood and can't get there -- because there's no way to roll it up. I don’t know how they get it up there." On the 471-yard, par-5 13th, water plays to the deep right of the fairway, and view-seekers should be sure to turn around after holing-out to catch one of the course's best views of the San Jacinto Mountain Surrounds. Rancho's longest par 4 follows. "The 14th is a really good hole for both men and women," Woodcock said. "It's a long par 4 that's about 450 yards from the back tees. And even though it says about 380 yards from the ladies' tees, it plays like 400. It's long and guarded by bunkers on the left, and then there's a bunker on the right that's short of the green." For vacationers aiming to tune-up before a game at one of the desert's longer and lauded courses, Rancho Mirage Country Club proves a sneaky, good round at a competitive rate. Pace of play isn't paramount here, so just ensure you enter the day with a casual purview. Full practice range, putting green and instruction are available, and a full-service grill is also on site.